Fun I Don't Do Mornings Clock. Nope. No 7, or 8 O'clock in our world. It just doesn't work. 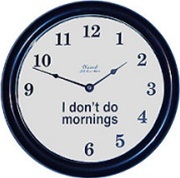 This clock sets a proper tone for us who just prefer to get the coffee pot fired up for 9 a.m.